When did the Berlin Wall cease to exist? I had a ringside seat at the event that would reshape Europe and reverberate across the globe; and still, I couldn't say exactly when that concrete monument to division and folly finally crumbled into dust and souvenirs. No plan existed for the Wall's demise. A country that had a five-year plan for everything from the production of cotton reels to spies and gymnasts could not predict or manage the event that sealed its end. The German Democratic Republic had fascinated me since childhood, so I'd grabbed every opportunity to travel there throughout the 1980s  the terminal phase of the G.D.R. 's existence, as it turned out. But when I returned in May 1989, the mood had changed. Something bitter and edgy had entered the soul of the semi-nation of 16.7 million Germans. My oldest friend, son of a senior nomenklatura professor, hugged me as we stood beside Checkpoint Charlie and I headed off, for the umpteenth time, to a break in what he called "my other world." With a new bitterness in his tone, he murmured "verdammte Mauer"  that damn wall. Hungary, one of the countries where East Germans could vacation, had opened its border at the beginning of the month, poking the first hole in the barbed-wire frontier across Europe. The Iron Curtain was rusting. The elections in the G.D.R. that May were intended to rubber-stamp communist rule. They merely confirmed a sullen atmosphere; even the official statistics revealed a decline in votes for the party line, while concealing the true scale of dissent. East Germans set off on holidays from which many did not return. By August, the streams of small pastel Trabant cars phut-phutting their way south to Dresden and into Czechoslovakia and Hungary told the true story. Seeking out breaches in the Hungarian-Austrian border through which to flee, or holing up in West German embassies, they wanted out. We joked that at this rate only the dissidents and the party bosses would be left to fight it out. Summer was long, hot and tense. The Czechs, with an equally hard-line government to that of the G.D.R., started to return East Germans and refused to let them through the western border. The fear of being "walled in" even further haunted the young. West German embassies were deluged with Ossis seeking asylum. At home, opposition groups, previously consigned to churches and kitchen meetings, flourished. I moved into the vast bronze-windowed monstrosity of the Palast Hotel. You couldn't get a fax without it passing through an office where, a waiter told me, copies were made and sent on to the Stasi, the state's intelligence service. In Erfurt, the grand cathedral city in the south, I befriended a group of young intellectuals: bookbinders, musicians and artists. One subsequently sent me a letter begging me to marry him  the quickest way to gain permission to leave was to wed a Westerner. "Not that I want to disturb your life in any way," he wrote, "but I just have to get out of here." In Autumn, Mikhail Gorbachev came with a breath of Moscow fresh air and publicly wagged glasnost at his truculent host, Erich Honecker. The German party leader played deaf and ordered mass arrests of demonstrators in the middle of East Berlin, just to jolly along the visit. Gorbachev looked grim and issued his Cassandra warning: "Those who come too late will be punished by life." (Being Gorby, he took far longer to say it than that; it was his savvy interpreter who made a memorable phrase of the Russian's comments.) The New Forum opposition movement adopted the slogan "No Violence!"  a demand, but with an undertone of real fear. Rumors of body bags and blood banks were spread to intimidate demonstrators. Honecker gave way to Egon Krenz, a man known unaffectionately as "horse face," who had built his career as the socialist crown prince and, after decades of party obeisance and Politburo maneuvering, would last precisely 44 days in office. Avalanche politics swept away one dust-encrusted institution after another. The Central Committee, resigned. The Politburo followed. "Who is it today?" the copy taker at the Times in London would ask when I phoned up to file another dispatch of mayhem. Power was in the streets, with the protesters and emigrants. WE ARE THE PEOPLE read the famous banner. And at last, the people were being heard. 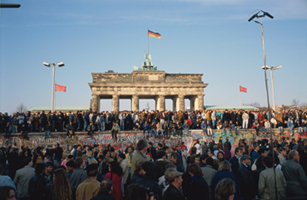 In one sense, the events vindicated the fears of the sclerotic regime: "In our hearts," Hans Modrow, the pro-Gorbachev party chief in Dresden would tell me later, "we knew that the fortified border was what kept this country together. We were stuck in a circular logic: no wall equals no G.D.R. So the fortified border had to stay, or what was the point of us?" Honecker, in power since 1971, had predicted "the Wall will still be standing in 50 and even 100 years if the conditions which led to its erection remain unaltered." Looking back at the pace of events, it now all seems like an inexorable roll towards a fall. It certainly didn't feel like that at the time: I guess if you'd asked me, I would have said that, whatever the changes, the Wall would be last to go. It imprisoned our imaginations, as well as those behind it.